All seven planets discovered in orbit around the red dwarf star TRAPPIST-1 could easily fit inside the orbit of Mercury, the innermost planet of our solar system. In fact, they would have room to spare. TRAPPIST-1 also is only a fraction of the size of our sun; it isn't much larger than Jupiter. So the TRAPPIST-1 system's proportions look more like Jupiter and its moons than those of our solar system. 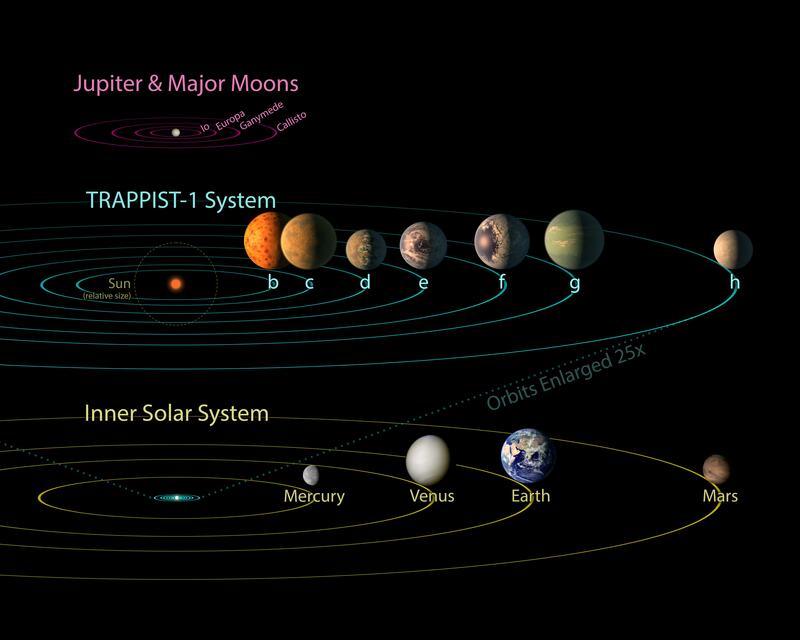 The seven planets of TRAPPIST-1 are all Earth-sized and terrestrial, according to research published in 2017 in the journal Nature. TRAPPIST-1 is an ultra-cool dwarf star in the constellation Aquarius, and its planets orbit very close to it. 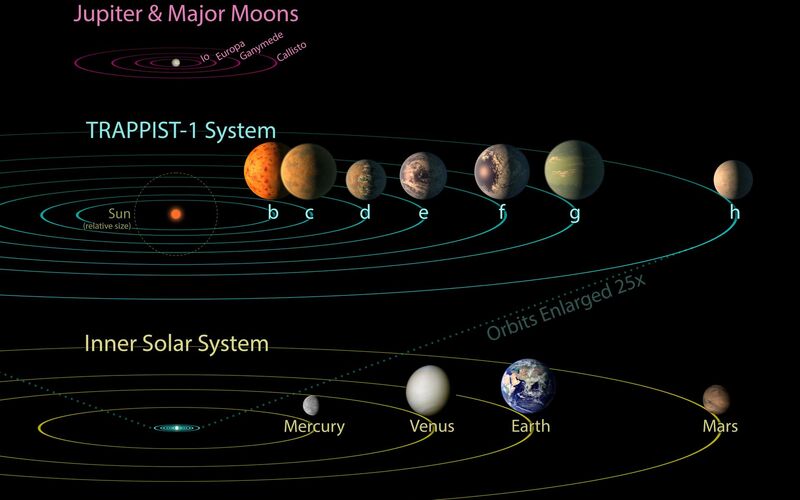 The system has been revealed through observations from NASA's Spitzer Space Telescope and the ground-based TRAPPIST (TRAnsiting Planets and PlanetesImals Small Telescope) telescope, as well as other ground-based observatories. 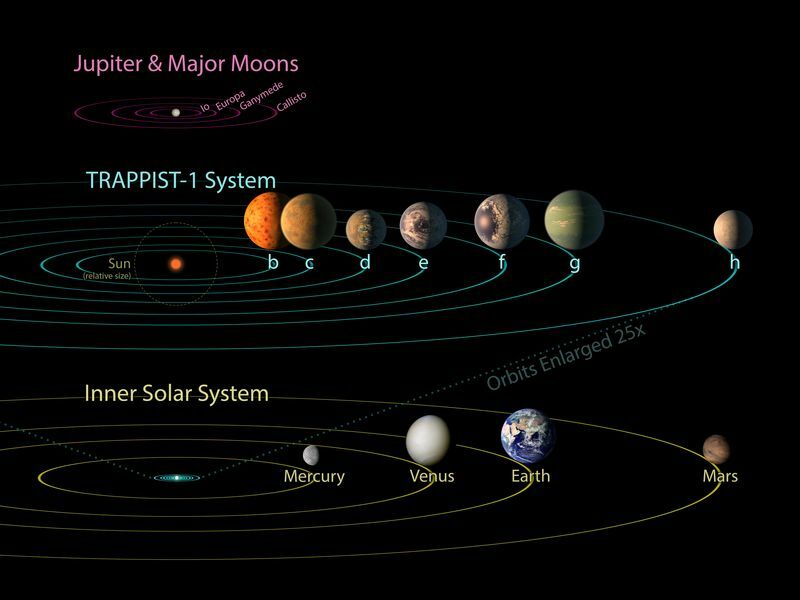 The system was named for the TRAPPIST telescope. NASA's Jet Propulsion Laboratory, Pasadena, California, manages the Spitzer Space Telescope mission for NASA's Science Mission Directorate, Washington. Science operations are conducted at the Spitzer Science Center at Caltech, also in Pasadena. Spacecraft operations are based at Lockheed Martin Space Systems Company, Littleton, Colorado. Data are archived at the Infrared Science Archive housed at Caltech/IPAC. Caltech manages JPL for NASA. For more information about the Spitzer mission, visit http://www.nasa.gov/spitzer and http://spitzer.caltech.edu.